▲ TV series "The Queen of the Office" deals with predicaments office workers face everyday. It points out Korean society's problem of non-regular workers. The recent TV series “The Queen of the Office”, also known as Jikjangui Shin, reveals the story of Ms. Kim, the protagonist, who is a temporary employee of a large corporation. Despite the recent trend of Korean working-class individuals who are desperate to become regular workers in large corporations, Ms. Kim voluntarily becomes a non-regular worker who applies herself in the workplace without formality and the constraints that normal non-regular and regular workers face. This series humorously yet also frankly talks about the plight of non-regular workers, which could easily be the story of students themselves. In fact, according to the National Statistical Office, 22.1% of university graduates are currently employed in the non-regular work force. Numerous university students in Korea are engaged in various part-time jobs and they are exposed to work environments similar to Ms. Kim’s in Jikjangui Shin. Nonetheless, they often seem to be indifferent to the issues that non-regular employees face even though they are directly involved. According to the survey done by The Post, 94 out of 109 students believe that they do not foresee themselves as non-regular workers. That is an astonishing 88% of students who consider the problems that non-regular employees face is irrelevant in their lives. The negligence of university students towards social issues such as non-regular employment is a grave problem because when social issues are not taken notice of, the possibility of finding solutions drops. In order for university students to shed more light on the issue, the issue itself needs to be keenly scrutinized. Before delving into the problem of non-regular employment, a precise definition of a non-regular employee is necessary. Non-regular employees are all employees that are not on an open-ended and continuous employment contract. Instead their contracts are time limited. The main types include employment on fixed-term contracts, temporary agency work and casual or seasonal work. These forms of employment lack the benefits that regular employees receive such as social insurance, severance and incentive based pay, protection from dismissal and finally, promotion guarantees. As is reported by the National Statistical Office, approximately 33.3% of employment forms are non-regular, which is around 5.9 million people, but the actual tally of non-regular employees is believed to exceed 10 million. South Korea started to establish the non-regular worker system after the IMF crisis hit between 1997 and 1998. Under the system, corporations were allowed to hire non-regular workers who could be dismissed anytime at the will of the corporation. This labor flexibility, which is a phenomenon caused by neoliberalism, has lain out a myriad of problems. As stated in a report by the OECD, South Korea’s biggest problem in the labor market is inequality and the gap between regular and irregular workers. Non-regular employees receive far less payment than regular workers. The average monthly pay of irregular workers is 52% of that of their regular counterparts. Not only do they receive half of the wage of regular workers, it is also lower than the minimum wage of 4,860 won per hour. Approximately 23% of non-regular workers are in such a situation. Lim Kyung-hyuk, a Public Administration major, mentioned that while he was working for a convenience store near his house, he was given 4,500 won per hour because he was inexperienced. His pay had not risen after three months of work so he had no choice but to quit his job. There is very little difference in the productivity of regular and irregular workers yet the wage they receive is far lower than regular employees. The working conditions are comparatively worse as well. While a regular worker receives his or her personal computer and a desk at office, non-regular workers must share a public computer between two or three people. It is common for them to have no personal desk and storage space as well. Many offices prioritize regular workers’ needs before non-regulars and such discriminations make it difficult for non-regular workers to preserve their dignity. In Hyundai Motors, for instance, different name tags are given to non-regular workers to differentiate them from regulars. They are required to put on vertical name tags while regular workers wear horizontal name tags. The gravest problem facing non-regular workers is perhaps job instability. Because they are given periodical contracts, their labor security is extremely low. Especially for dispatched workers and other indirectly hired workers of non-regular employment, job security is often worse. Last year, many universities, including Hongik, Yonsei and Dongguk, ruthlessly laid off hundreds of cleaning laborers unilaterally. This caused a strike on numerous campuses and many, including students, have suffered as well. One cleaning laborer at Dongguk University who wished to remain anonymous recalled the experience, “I was not able to pay for my rent and my life literally had to stop. The workplace that I once belonged to gave me nightmares and I have not been able to get over them.” What actions is government taking to protect our least powerful workers? Under the administration of former President Roh Moo-hyun, the Non-Regular Employee Protection Law was created with its full intention to be the protection of the rights of irregular workers. The law states that when corporations hire irregular workers their contracts must last at least up to two years. However, most companies have taken advantage of the law and have arbitrarily sacked workers. The law that was meant to guarantee job security for irregular workers backfired when their employers simply to chose to lay them off before their term expired. The number of irregular employees, therefore, increased by 3 million. Former President Lee Myung-bak took a different measure and allowed for more freedom in public institutions. Labor flexibility increased among public institutions and created the trend of dismissing irregular workers. The countermeasures that sought to solve the problems that irregular workers face became the measures that would help to dismiss them more freely. In fact, 420 workers of KBS (Korean Broadcasting System), 3,000 of National Agricultural Cooperative Federation were mercilessly removed from their work places. While none of our previous governments’ policies have done much to protect non-regular workers, the current administration of President Park Geun-hye has passed revisions to the “Non-Regular Worker Protection Act”, which is designed to eliminate discrimination against non-regular workers. The revisions are significant in that they have specifically defined the forms of discriminatory treatment described in the existing Act. The new provisions specifically state that irregular workers cannot be discriminated against for unjustifiable reasons in terms of wages, bonuses, performance-based rewards or fringe benefits. ▲ On Labor Day, May 1st, about 10,000 people gathered at Seoul Plaza to celebrate the 123rd International Labor Day. Dongguk University’s laborers with Ham Gge No Se participated in the event as well. While the current government of President Park has been in power for less than three months we have yet to see what affirmative changes their policies will bring in the future. Meanwhile, certain university organizations are taking actions to demand changes in the policies of non-regular workers. At Dongguk University, Ham Gge No Se, which means “together we make a better laborers’ world”, was created by the student council at the College of Social Science, Department of Political Science and Diplomacy, and Marx, a school club that deals with economics. Their major goals are to abolish the unilateral dismissal of non-regular workers inside and outside of universities, to bring solutions to youth unemployment, and to fight against privatization of public enterprises. In order to fulfill their goals, they have been conducting various activities such as providing counseling sessions for students who have been exploited at their workplaces with certified labor attorneys. 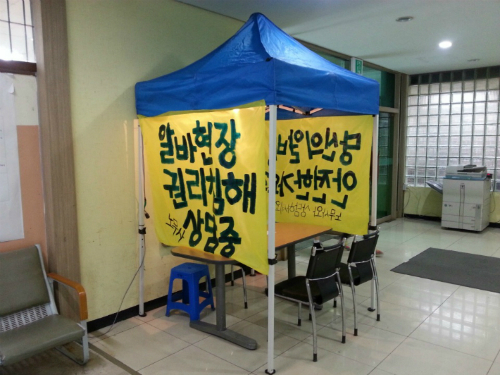 Choi Eun-mi, the president of the organization, has stated that many students have come by the booth and have learned about the basic policies and laws that are there to protect them against unjustifiable treatment. ▲ Ham Gge No Se provided counseling sessions with certified labor attorneys for students who have been exploited at their workplaces. Besides providing counseling sessions, the organization has also participated in assemblies that are held in different parts of the city that deal with labor inequality. They actively took part in the National Workers Rally, where they merged together with the cleaning workforce of Dongguk University and fought for their labor rights. “This was the most memorable event that I’ve done here with Ham Gge No Se. We practiced for the ensemble for a long time and spent quality time with the workers. We were able to hear their stories directly,” said Choi, who still today is busy planning various activities for the organization. “We believe that this year will be our most important year because Ham Gge No Se has been founded. It is to date the largest laborer right organization that has been created by students. It has been quite successful and we are planning to continue to move the organization forward in the following years,” added Choi, who hoped that more Dongguk students would actively participate in the events to be created. ▲ Ham Gge No Se spent the whole month of April, promoting the rights that non-regular workers deserve. They sought to alert students about the indifference that they have shown to this social issue. Another organization that works for the rights of non-regular workers is the National School Non-regular Labor Union. It was formed in 2011 in order to fight for the rights of laborers who suffer both physically and mentally at their work places. Currently there are sixteen branches nationally and a total of 150,000 members registered. Many university student bodies, including that of Korea and Chung-Ang University have worked with the Union in order to guarantee better working conditions for school laborers. Last year, thirty students from Korea University’s Business School and College of Liberal Arts gathered together for a strike on their campus. Through the strike, they expressed their will to support non-regular laborers on their school grounds. Lee Sun-kyu, the executive director of the National School Non-regular Labor Union, expressed his gratitude towards the students who actively participated in the strike and mentioned how it is important to teach the students the value of labor. He added that the Union welcomes any student body who wishes to support them. Students may not have a huge impact on the government, but as the old saying “Many drops make a shower” goes, when a lot of students gather together to make a difference in society, nothing can be too difficult. Professor at the Department of Sociology, Lee Han-mae, commented, “Our society is composed of people and if people, especially college students, one by one, take notice of the issues that cause harm in our society, and wish to change them, the change will definitely take place.” The problems facing non-regular workers may not seem imminent for us right now, but if we do not begin to take notice soon, they will become problems that eat away at us all.